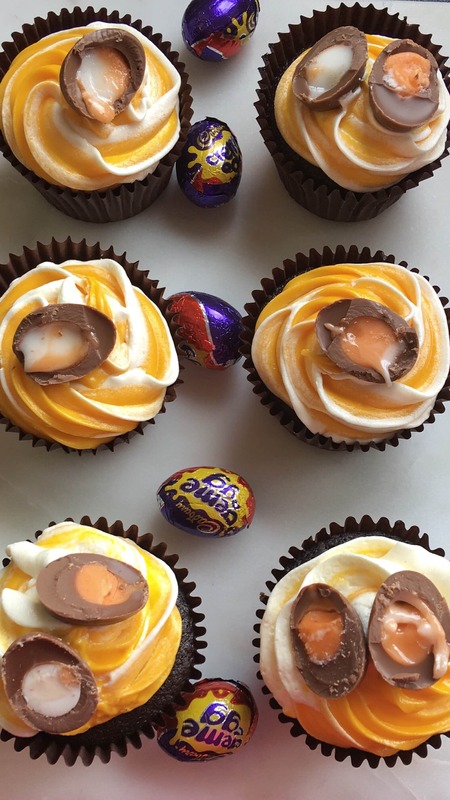 I’ve updated my Cadbury creme egg cupcake recipe for you all…just in time for Easter weekend! Don’t go saying I ain’t good to you all now…? 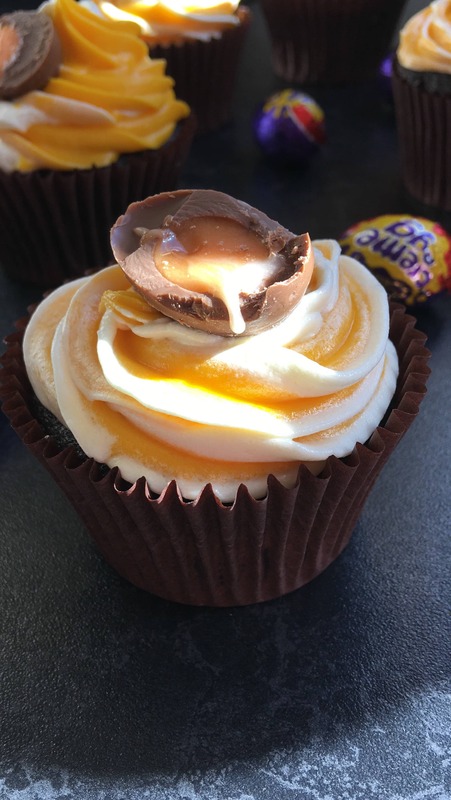 I first posted a creme egg cupcake recipe back in 2012 – it was actually my very first post! Have I really been blogging that long?? ? As good as those ones were, I actually prefer the updated recipe I’m sharing with you today. So what about these cupcakes? Well, the cupcake recipe is a rich Devil’s chocolate sponge which is complemented perfectly by a simple vanilla buttercream. Each cupcake has a surprise inside – a whole mini Creme egg! There are quite a few changes to the new recipe – the cupcake recipe itself is different, I’ve done away with the yellow fondant which I now feel is too sickly sweet against the richness of the chocolate cake, and this time I didn’t bake the creme eggs in the cupcakes, placing them in the cakes after they were baked instead. You can absolutely choose to bake them inside the cakes if you prefer, but if you do I would recommend you freeze your creme eggs first. And if you aren’t a coffee fan, fear not. These cupcakes will NOT taste of coffee! The coffee merely enhances the chocolate flavour. But you can leave it out if you really want too. I love these cupcakes – they cheer me up just looking at them! I really hope you love them! 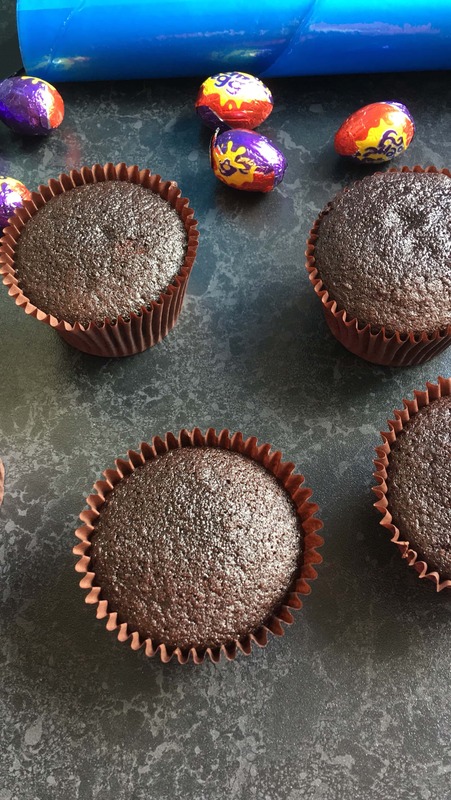 If you give these cupcakes a try this Easter weekend, let me know by leaving a comment! Devil's chocolate cupcakes with a fun surprise - a Cadbury creme egg middle! The perfect Easter treat! Preheat the oven to 180C/160Fan/350F. Line a 12 hole cupcake pan with liners. Place the cocoa powder and coffee in a medium bowl. Pour over the boiling water and whisk until smooth. Place the flour, bicarbonate of soda and salt in a small bowl and stir together. Place the butter in a large bowl, add the brown sugar and beat until the mixture is very light and fluffy. Add the egg, egg yolk and vanilla and beat until the mixture is smooth. Add the cocoa mixture and mix until smooth. Using a metal spoon, fold in the flour. The mixture will be pretty runny so don’t be alarmed. Bake for 18-22 minutes or until the cakes are risen and they spring back when lightly pressed. Transfer the cakes to a wire rack and leave to cool. While the cupcakes are cooling, make the buttercream. Using an electric mixer, beat the butter and icing sugar together on high speed for several minutes until very light and airy. Beat in the vanilla extract and milk and continue to beat for a few minutes until very smooth and aerated. Divide the buttercream equally between two bowls. Place yellow or orange (for the “yolk”) food gel colouring in one half and stir well to mix. I used Wilton golden yellow. Place the buttercream in a piping bag fitted with a star nozzle – one colour on either side – and start piping onto a plate until the colours have swirled together. You’re now ready to decorate your cupcakes! Take your cooled cupcakes and using an apple corer or cupcake tool, remove a piece of cake from the middle of each cupcake. 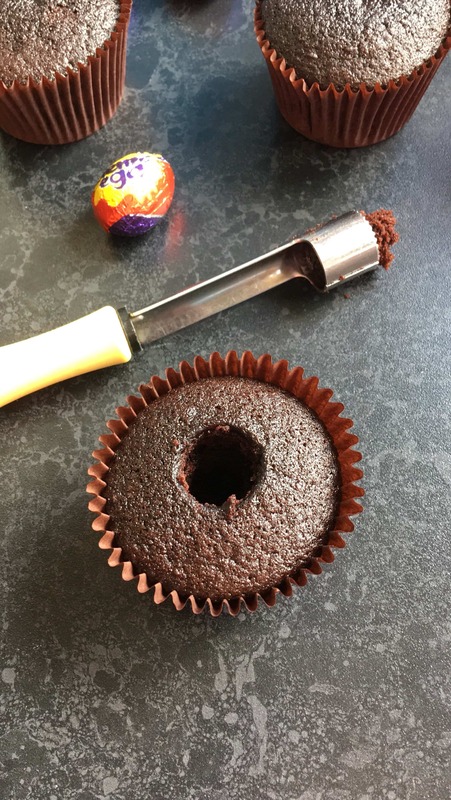 Then insert a whole mini creme egg inside. I’ll leave it entirely in your hands what you do with the cake you just removed – if you don’t want to eat it all like I did and clearly have more willpower than me, you can always keep it for making cake truffles! 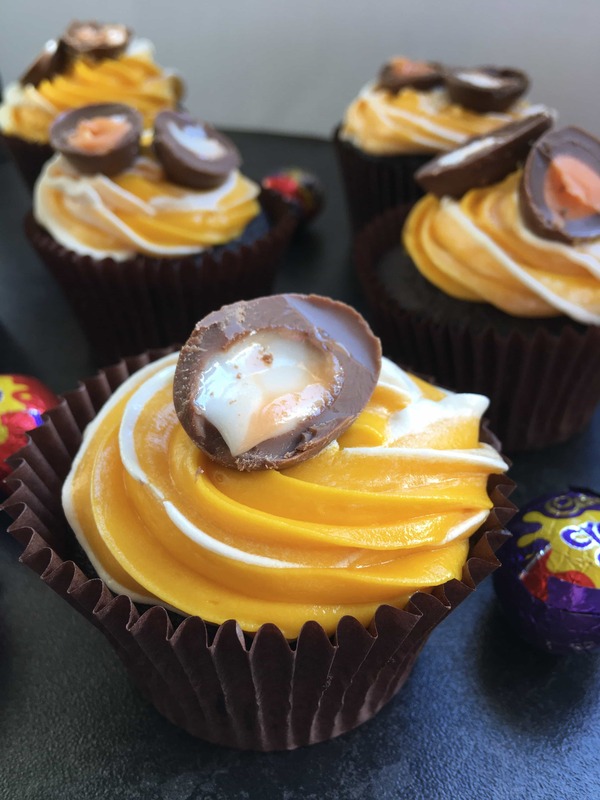 Decorate your cupcakes with the buttercream and top each one with a halved Creme egg, letting the yolk spill out for an “EAT ME NOW” effect! These are the absolute epitome of Easter! What a lovely way to include these classic Easter treats in a pretty little cupcake.